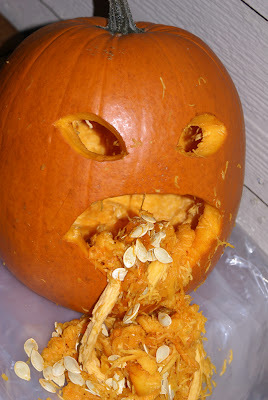 Indian Food Rocks: Angry Vomiting Pumpkin! This is so good - even I want to do it! And these days, we do get small, fully ripe (meaning orange on the outside) pumpkins at the market! I love it! You guys had a great time - watch that candy, now! 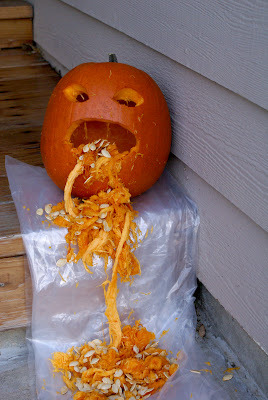 In the Pumpkin carving party of our area, the puking pumpkin got 1st prize. It was carved by a 11 year old boy. The worst pumpkin prize was won by his mom :)):)). I was the judge. medha's costume is super cool :) no wonder it was a gr8 hit. and puking pumpkin is too good. ah! stopped by cops who wants to give candy...nice! and that pumpkin is gross...got the right effect manisha.. HeHe!! So scawwy and disgusting!! it looks gross!! hope u got the right kind of compliment for the pic.. Aaarrrgghh!! puking pumpkin!! just right for halloween though!! Way to go Medha!! I'd be dancing too if someone (specially a cop) stopped to compliment me an dgive candy!!! Homemade costumes are the best. Obviously, Medha had a blast making it AND strutting around in it. Did you get a lot of candy? Wow! that is some halloween pumpkin carving :-D. Very appropriate ;). And Medha's costume did indeed deserve all the attention! it was great! Glad that you guys had loads of fun! Lovely pumpkin. And did you light it up at night? What a coincidence, we got our first candy from a policeman too. He was just making sure the trick-or-treaters were safe, and we thought it was so nice of him to give us candies. Anita, don't waste that gorgeous pumpkin! I will have a recipe for you either over the weekend or by early next week. Reena, only one thing can be said: you have excellent taste! Nabeela andManasi, seriously! You two need to dress up for next Hallowe'en then! Rachna, thanks for noticing! The angle makes all the difference! Marysmom, far too much candy. I am going to give it away soon. Sia, Rajitha, Asha, Swaroopa, Muy and Rina, thanks! We had fun! The eyes could have been made to show more distress but we were working under pressure here! We had barely any time in which to do this and put it out before the first tricksters arrived! Nice idea and cool pics. :)) That's a great idea! 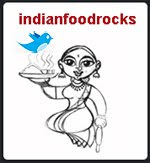 Manisha, just came across this lovely site, ignore it if you are aware. Has a few halloween costumes/carvings etc just in case you need. :) Have a great OKTOBER!